Tim Wheeler is the son of the late Don Wheeler, the husband of Joyce Wheeler and the father of Morgan Wheeler, and Nick Wheeler. Tim Wheeler is the national political correspondent of the CPUSA's newspaper, People's World. He has been a reporter and editor for the working-class press for 43 years. 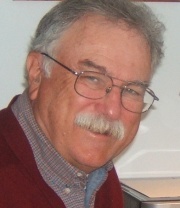 He lives in Baltimore, MD, and in Sequim, WA, with his wife Joyce Wheeler. He is the son of late Soviet spy Don Wheeler. In 2014, Tim Wheeler was listed a a friend on the DuBois Clubs Facebook page. The list included Tim Wheeler and Joyce Wheeler. Tim Wheeler writingin the Peoples Weekly World, just after the death of Ted Kennedy in August 2009. I was a senior at Amherst College in the spring of 1964 when I boarded a chartered bus with my wife Joyce and our son Morgan, then less than six months old, for a trip to Washington, D.C., to lobby for passage of the Civil Rights Act of 1964. When we arrived in the nation’s capital we went to a hearing room in the Russell Senate Office Building. We were greeted there by a young freshman, senator from Massachusetts named Edward M. Kennedy. He welcomed us and offered some strong comments in favor of passage without crippling amendments of this landmark bill to end the shameful legacy of racist segregation. He was getting really wound up when Morgan started fretting. Joyce and I tried without success to quiet him and finally I took him and started for the door. “Don’t leave. Come on back and sit down,” Kennedy said. “A baby crying isn’t going to hurt any of us. Someday he’s going to be a Young Democrat.” The crowd laughed and applauded and I sat down. And as I remember, Morgan stopped crying. I never forgot that incident. Ever since, I’ve had a warm spot in my heart for Ted Kennedy. In November of 1980 Tim Wheeler went to the Soviet Union with a delegation of about 20 people. In 1986 Tim Wheeler was a Staff Writer for the Communist Party USA newspaper People's World From 1991 to 2003 Wheeler served as editor of the Peoples Weekly World. Currently he is the Peoples World national political correspondent. In 1993 Tim Wheeler attended the Syrian Communist Party conference. Greetings were sent from Tim Wheeler and Joyce Wheeler.. In December 1999, a Communist Party USA meeting was held at the May Day Bookstore in Minneapolis, Minnesota, for the purpose of re-establishing the Communist Party USA Farm Commission. Party members present were Erwin Marquit, Helvi Savola, Jack Brown, Peter Molenaar, Morgan Soderburg, Bill Gudex, Mark Froemke, Scott Marshall, Gary Severson, Mike Madden, Becky Pera, Charlie Smith and Tim Wheeler. Mark Ritchie (now Secretary of State for Minnesota) also attended and addressed the meeting. In a written report on the meeting by Tim Wheeler, Ritchie is referred to as a "non-party friend" of the Communist Party. The report was marked "not for publication". Click here for the entire report. On March 30 2002 the Communist Party USA paper People’s Weekly World called for a national holiday in honor of late Farm Workers Union leader Cesar Chavez. The article was followed by a long list of endorsersincluding Tim Wheeler, Almost all endorsers were confirmed members of the Communist Party USA. In September 2006 the Peoples Weekly Worldlisted several members of the Baltimore Wheelers affiliated to Communist Party USA. Tim Wheeler and Joyce Wheeler, Morgan Wheeler and Tina Wheeler, Nick and Maureen, Susan M., Stephen Vause and Calyn Syvanen, Marion Burns. In 2008 Tim Wheeler and his friend Rev. Pierre L. Williams of Baltimore canvassed for Obama in South Carolina in January 2008. I have been canvassing with a friend, Rev. Pierre Williams, a United Methodist minister in Baltimore. We got a vivid feel for just how deeply Obama's message is resonating here going door-to-door in a working class neighborhood yesterday. The Obama people are over the moon. I was at a precinct some four or five miles outside of Columbia, mainly a rural area. And it was a steady stream of voters all day. Overwhelmingly African American voters. There was a feeling of victory in the air. I'm at the Obama headquarters and you can hear the cheering all over. It's really very exciting. In early 2008 Tim Wheeler, his wife Joyce Wheeler and another Communist Party USA couple Jim Baldridge and Margaret Baldridge were all active members of Obama's Baltimore operation-organizing canvassing, phone banking and general campaign work. . 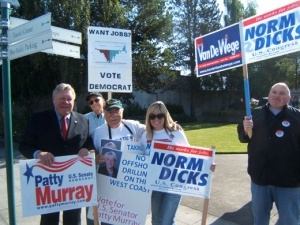 In 2010, Tim Wheeler and Joyce Wheeler worked in Democratic Senator Patty Murray's campaign in Sequim, Washington State. The highest profile election victory here Nov. 2 was the reelection of Sen. Patty Murray. She defeated Republican Dino Rossi by more than 100,000 votes. I was asked to coordinate street-corner "waves" for Murray here in my hometown. We could tell Murray was doing well by the number of motorists, especially women, who honked and gave us the thumbs-up salute, far outnumbering the Republicans who gave us a sour look and the thumbs-down. My wife Joyce and I spent one afternoon canvassing for Murray up on Bell Hill, where my family once owned a dairy farm. It is now crowded with luxury homes with panoramic views of the Strait of Juan de Fuca and Mount Baker. Washington State voters helped put up a firewall against the ultra-right in reelecting Murray, blocking a GOP majority takeover of the Senate. Victory was won when the coalition of unions and other progressive organizations succeeded in getting out the vote. The meeting was called to order by Chairman Matthew Randazzo in the party headquarters , Port Angeles. More than 45 people attended. Elected precinct committee officers present were Andrew Shogren, Pat Johansen, Derek Medina, Marcia Farrell, Roger Fight, Kim Bowlby, Earl Archer, Steve Tharinger, Pam Stinson, Chuck Hatten, Steve Markwell, Sylvia Hancock, Loren Kruetner, Norma Turner, Joe McGimpsey, Ed Grier, Dale Holiday, Hank Warren, Kris Grier, Katie Osorio, Cliff Tassie, Mike Doherty, Graham Hutchins, Scott Clausen, Doug Lewis and Matthew Randazzo. Others attending included Patsy Feeley, Paula Doherty, Leroy Martin, Jay Garrett, Ron Johnson, Jr., Max Mania, Nina Richards, Ron Richards, Tim Wheeler, Joyce Wheeler, Honeybee Wheeler, Dan Duncan, Dottie Nicassio, Richard Jepson, Barbara Jepson, Paul Martin, Tanya Altstatt Menchaca and John Marrs. Honeybee and I are heading down to Bremerton to doorbell for Nathan Schlicher for State Legislature. Voters got their mail ballots a couple of days ago. Yesterday we doorbelled in Port Angeles for U.S. Rep. Derek Kilmer, for Sissi Bruch for County Commissioner, for Steve Tharinger for State Legislature, Mary Ellen Winborn for Director of Community Development. Rep. Kilmer grew up in Port Angeles. He lives in Gig Harbor with his family but he was "back home" doorbelling in PA yesterday. I knocked on one door on 10th St. in PA. A man answered and I gave my pitch. "We're doorbelling for Rep. Derek Kilmer and...." He cut me off. "Derek Kilmer's dad was my favorite teacher. You've got my vote for the entire ticket and my wife's too." Nothing like having a "favorite son" on the ballot! DON't FORGET TO FILL OUT YOUR BALLOT AND DROP IT IN THE MAIL! — with Sissi Bruch, Carlyn Syvanen, Steve Tharinger and Norma Turner. The Clallam County Democratic Party held its annual "Franklin & Eleanor Roosevelt Dinner" last night at the S'Klallam Tribe's, Seven Cedars Casino in Blyn. The "Wheeler Clan" was honored as "Democrats of the Year." We were showered with congratulations including from former Washington Governor, Gary Locke, the guest of honor. Sylvia Hancock, a staunch, progressive Democrat, who had nominated us spoke to the crowd of about 200, hailing us for our energy and enthusiasm. The program booklet features a picture with the following words: "Clallam County Democrats are proud to announce the Wheeler Clan as the 2015 Democrats of the year." It continues: "Tim and Joyce Wheeler, Steve Vausen and Carlyn Syvanen, and Honeybee Burns, affectionately known as the Wheeler Clan, are the 'gold-standard' doorbelling team in Clallam County! They have consistently gone above and beyond the call of duty to 'get out the vote' for Democratic candidates from local races to State, National and Presidential elections. Come rain or shine, heat or cold, or dark of night, the Wheeler Clan does not give up until the job is done!. Whether it is managing a booth at the Clallam County Fair, organizing and participating in a street corner "wave," bringing their positive enthusiasm and handmade signs to local parades, actively participating on the Executive Board or walking miles and miles to knock on yet another door, the Wheeler Clan is there, always with smiles and contagious enthusiasm for Progressive issues, causes and candidates." On behalf of the family, I thanked Sylvia and the Clallam Democrats. 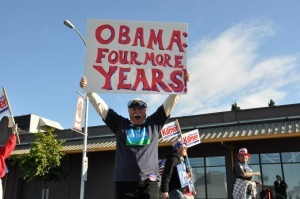 Thanks to Sylvia's leadership and the strong efforts of progressives in our county, President Obama carried Clallam County narrowly in both 2008 and 2012. (I must hurry. We are going out right now to do doorbelling for Mark Ozias for Clallam County Commissioner). — with Steve Vause, Carlyn Syvanen, Joyce Wheeler and Honeybee Wheeler Burns. In July 2015, Members of African American Equality Commission Communist Party USA FaceBook group included Tim Wheeler. 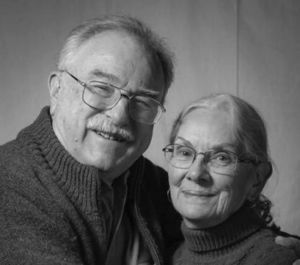 In 2016 Tim Wheeler was a member of Puget Sound Advocates for Retirement Action. Those invited to participate on on Facebook included Tim Wheeler.